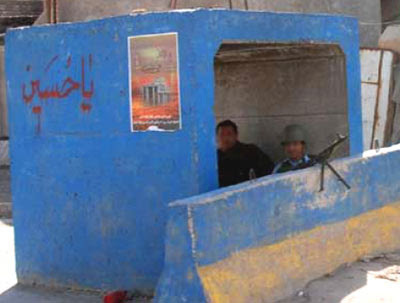 “Two Iraqi Policemen, from the Juaifer Police Station, staff a checkpoint in the Salhiya neighborhood of Baghdad recently” -- the caption accompanying this picture from the April 14 issue of The Advisor, a weekly English-language publication of the Multinational Security Transition Command-Iraq, unwittingly highlights the biggest problem facing Iraq and the U.S.-led coalition forces – sectarian violence. To Iraqis, there is no mistaking the meaning of that phrase. It is an invocation of the name of the third Shia imam. Hussein was the grandson of Muhammad, revered by Shia, but not by Sunnis. In fact, the Shia reverence of Hussein (and his father Ali) is one of the major points of contention between the two Muslim sects. The major holiday of the Shia calendar – Ashura – commemorates Hussein’s death at Karbala in the 7th century; the Imam Hussein shrine in Karbala is one of the holiest sites in Shia Islam. The religious poster next to the name of the imam appears to include a picture of the shrine. That shrine in Karbala was attacked on April 14, resulting in the death of almost 50 people. This is undoubtedly part of the continuing wave of violence by Sunni insurgents attempting to goad the Shia into re-igniting the civil war that has plagued Iraq since February 2006. The beginning of the civil war is generally believed to have been triggered by the attack on another Shia shrine – the al-Askari mosque in Samarra - by members of al-Qaeda in Iraq. The Shia have been relatively quiet since the American-led surge began in January, content to have the American forces focus on the Sunnis while they lay low. Sunni provocations continued on April15 when four more bombs were detonated in Shia areas of Baghdad. The police checkpoint shown in the picture is located in the Salhiya section of the al-Karkh district of Baghdad, described as a mixed Sunni-Shia neighborhood that includes the violent Haifa Street area. This area is north of the Green Zone on the west bank of the Tigris River. When Iraqi police stations are adorned with Shia religious invocations, what are the Sunnis to think? Is this supposed to give the appearance of a fair and impartial “Iraqi” police force, or is this a not-too-subtle reminder that the army and security forces are overwhelmingly Shia? If you were a Sunni, would this fill you with confidence? To the Sunnis in Baghdad, the “surge” might appear to be nothing more that the introduction of Shia security forces into their neighborhoods, hardly a comforting thought. This picture, supposedly a sign of progress toward a solution, in reality underscores the magnitude of the problem. Don’t we have people at CENTCOM that can read Arabic and see what is going on?